According to information supplied by the station, WKLC signed on the air on 1300 kHz on Jan. 14, 1956. On May 27, 1963, WKLC was acquired by St. Albans-Nitro Broadcasting Co.
An advertisement for WKLC in the Charleston Gazette from May 1961 is wklc.gif. According to information supplied by the station, WKLC-FM signed on the air on 105.1 MHz on Jan. 1, 1966. The 1969 Broadcasting Yearbook shows these personnel: Ray Kandel, pres; Robert A. Entley, gen mgr; Harry Anthony, coml mgr; Randy Talley, prog dir; James Combs, chief engr. “St Albans — a Nice Place To Live,” provided by Mike Ballburn. On Feb. 23, 1980, the stations were acquired by WKLC, Inc. In the 1980s, AM-1300 was using the call letters WKAZ. In 2011, AM-1300 was using the call letters WJYP with a religious format. The call letters stood for Joyful Praise. In 2017, WKLC-105.1 was broadcasting a rock format and WJYP AM-1300 was broadcasting a sports format as the Jock, and simulcasting with WMON in Montgomery. This is a comment posted to Facebook by Robert in 2018. It is used here with his permission. I am the person who first signed WKLC-FM on the air, New Years Eve, December 31, 1965, 11:55 PM. I took requests and played 1965 rock music from Midnight until 8 AM. Owned by Raymond Kandle and managed by Bob Entley. I had worked at WKLC AM before joining The United States Air Force during the Vietnam War. I was home on leave, when Entley asked me if I would do the honor of "being the first" to sign it on. It was NOT Rock 105, but an all album format of MOR music with a library of hundreds of LP albums. The transmitter was located on Dry Ridge Road. The chief engineer was Bernie Clark. Studio location on sixth avenue in St. Albans. More than a decade before Lynn Martin brought the station. Prior to that, in 1964, as I was hired to do afternoons at WKLC-AM, I replaced James E. "Mike" a.k.a. "Mad Dog" Roark, who later became the Kanawha County Prosecutor and then the Mayor of Charleston, WV. He went to prison after stealing cocaine from the county evidence room. Also, the new building on Kanawha Terrance was the first home and beginning of Kanawha Cable TV, (no internet) which became, after Ray Kandle sold it, had many other owners and name changes, Suddenlink Cable. That's rights, cable TV, in the valley started at the WKLC. Drugs become the downfall for many of those who came after the beginning. The formats were MOR, religious, country, and eventually Rock 105. Tim Martin contributed the following section in 2015. 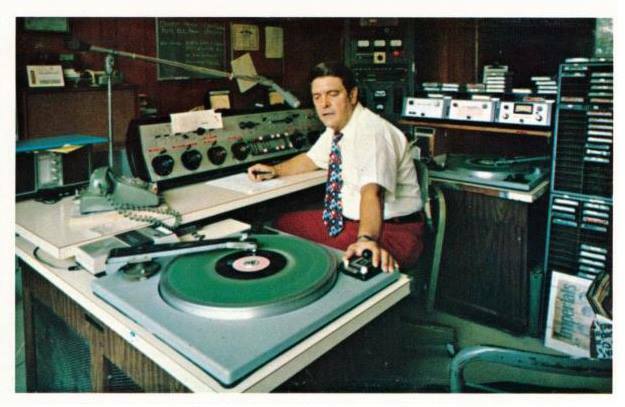 Thought you might like some additional info on WKLC-AM - 1300 and WKLC FM 105.1, in St. Albans, WV, especially for the years from 1969 - 1975, as I was DJ for those stations during that time period. I’ll share with you a bit about the WKLC family from that era. WKLC AM - 1300, a 1 KW station, began broadcasting on January 14, 1956. It signed on the air at 6 AM every morning with sign-off times varying, as it was a daylight station - sign-off as early as 4:30 PM in December, and as late as 7:30 PM in June. It had religious programming up until around 10:30 AM, had a “swap shop” program for 30 minutes and then played current music and oldies for the remainder of the day. WKLC FM - 105.1, a 50 KW station, had an easy-listening format and was on the air from 7am until 1am seven days a week. We played music by artists such as The 101 Strings Orchestra, Andy Williams, Barbra Streisand, BJ Thomas, Bobby Goldsboro, Dionne Warwick, Engelbert Humperdinck, Ferrente and Teicher, Floyd Cramer, Chet Atkins, Tony Matola, Boots Randolph, Glen Campbell, The Jackie Gleason Orchestra, Glen Yarborough, Gordon Lightfoot, Nancy Wilson, Harry Belafonte, Matt Monroe, Herb Alpert and the Tijuana Brass, Johnny Mathis, Lenny Welch, the Lettermen, Mantovani, Neil Diamond, the Percy Faith Orchestra, Perry Como, Rod McKuen, Ronny Aldridge, The San Sebastian Strings, Olivia Newton John, The Carpenters, The Fifth Dimension, The Four Freshmen, and on and on. We took requests, which is unheard of today, so we obviously played records (our library consisted of over 6000 albums). It was a bit scratchy at times, and with an occasional skip, but it was personalized. In its beginning, WKLC AM 1300 was located at 109 6th avenue in St. Albans. In the mid ’60s, it moved into a brand new building at 100 Kanawha Terrace (its present location) to facilitate the acquired FM license - air date of Jan 1, 1966. John Cote owned the station until around 1968 when it was sold to Ray Kandel, and in 1971 it was sold to William B. Harrison (WBH Incorporated). Office personnel were Robert (Bob) Entley - GM, Commercial managers - at various times - were Gloria Entley, Mary Reppert and Jack Batton, Harry (Hechesky) Anthony - Sales Manager, Bic Scott - sales, Jim Loudermilk and Randy Talley - Program Directors. Chief engineers were, at various times, Bernie Clark, Jim Combs (60’s), John Garner, (early 70’s), William F. Ford and Don (Jake) Seaton. The station, in July of ’71, changed management with “Skeeter” Dodd becoming general manager. Network affiliations were ABC (American Broadcasting Company) and MBS - the Mutual Broadcasting System. We would broadcast various activities in St. Albans, such as parades, remotes from the St. Albans Town Fair, downtown Christmas remotes, and - of course - the arrival of Santa. WKLC also covered St. Albans High School - Red Dragons sports; football, basketball and baseball. The sports broadcast team usually consisted of Bob Entley, Randy Talley, Harry Anthony and Paul Dunkle. Other station personnel would assist in the sports broadcasting from time to time. Some of the DJs from that time were Jim Loudermilk, Jim Combs, Jerry Fletcher, Dave Cottrell, Chris Wright, Tim Martin, Randy Talley, Pat Gallagher, Mary Jane Gallagher, Dennis Halstead, Chuck Riffee, Larry Ellis, Bill Lockhart, Joe Henson, Keith “Doc” Brown, Bob Adams, Robert Fink, David McCullough and Ed McDonald. There were probably a few others whose names I cannot recall at this time, to which I apologize. One DJ of note was Ed Rabel who worked at the station as a teenager, who in 1963, went to work at WCHS-TV and eventually was noticed by CBS and became a news correspondent for them, and later for NBC. The AM format changed around ’73 to country and the FM in ’75 to county and later to a classic rock format. By then, most of the above aforementioned personnel had left, but a few were still there. Sadly too, many of the people have passed on - Bob Entley, Harry (Hechesky) Anthony, Joe Henson, Paul Dunkle and Bob Adams. Equipment: WKLC AM’s major studio equipment was a Gates President Control board, 2 Gates turntables with Shure cartridges, three Spotmaster cart machines and of course a rack for various other needed equipment - reel to reel, patch panel, etc.). The 1 KW Collins transmitters was located on West Main Street. WKLC FM’s major studio equipment was a Gates Stereo Yard Control board, 2 Gates turntables with Shure cartridges and two Spotmaster cart machines and a rack for monitoring equipment. The Gates 5 KW transmitter had an antenna configuration that gave us an effective radiated power of 50 KW and was located on Dry Ridge Road. For remotes, we used a Gates Dynamote '70', providing four channel mixing capabilities.